Today is day two of my 12 Days of Blogmas, where I'm sharing 12 Christmas themed posts! You can check out Day 1 here. Christmas is my faaavorite holiday. I love it all from the decorations and lights, to food, music, smells, clothing, everything. It's so festive and happy and I have the best memories of Christmas with my family. That's another post for another day though. 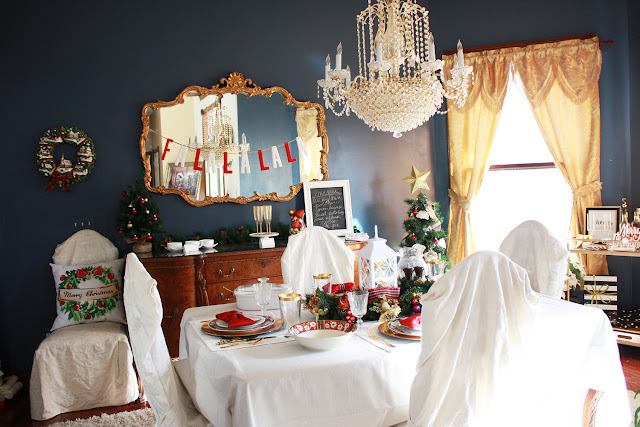 But today I'm sharing my dining room set up a la Christmas! 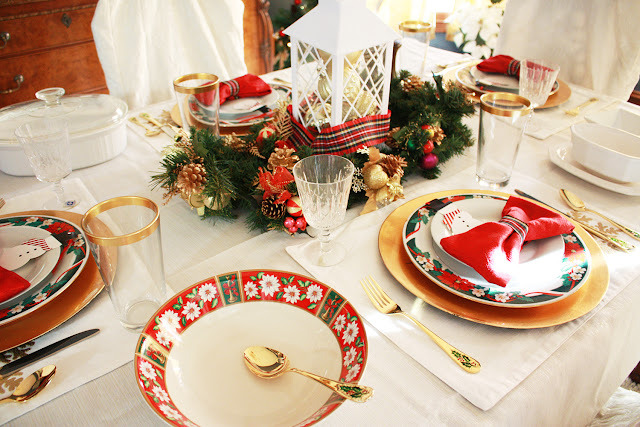 I decked it out in all things red and green and I am so excited to share it with you all! I hope it gives you some inspiration on how to set your tables this Christmas! 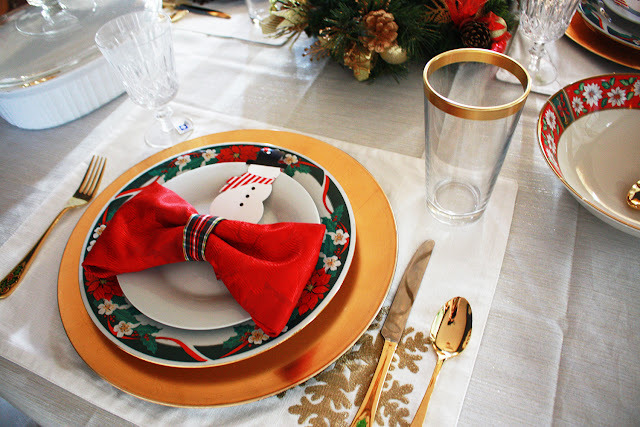 I stuck with pretty traditional Christmas colors for my color palette and theme: red, green, white and gold. 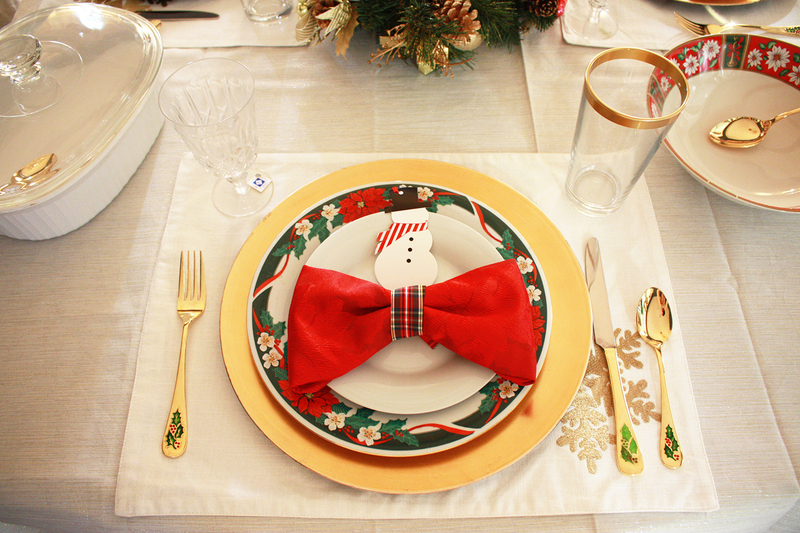 I also have the patterns of plaid and the poinsetta's on the dinner plates. 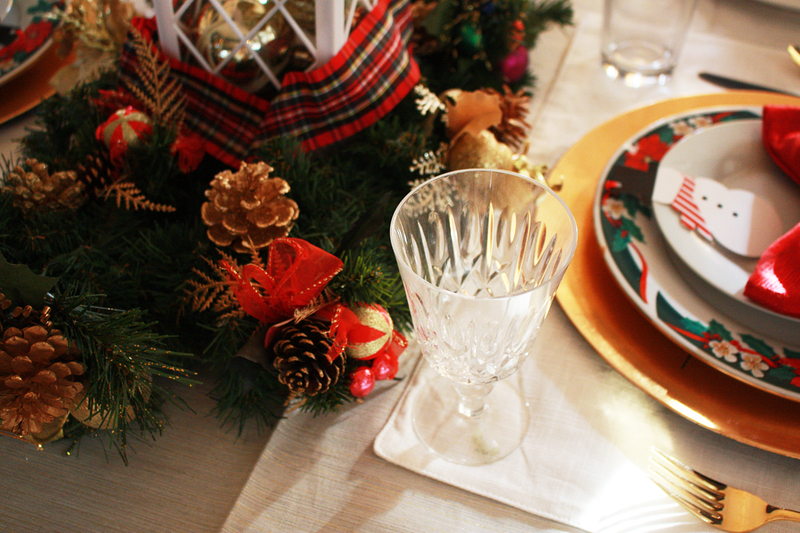 The theme is classic mixed with bright and fun. 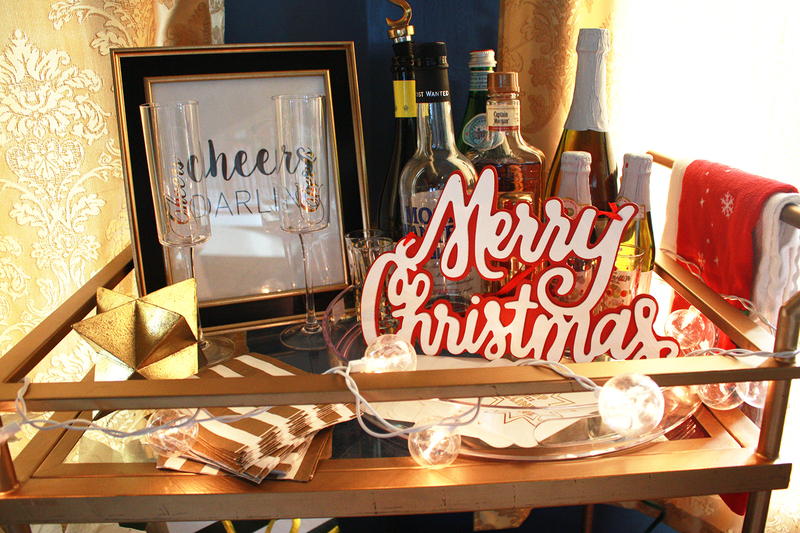 To jazz up my bar cart I found these 'Cheer's champagne glasses at TJ Maxx, perfect for the holidays (and all year round). I added this 'Merry Christmas' sign I found at Target in front of my bottles, wrapped a mini string of Christmas lights around the top, added some fun present boxes (also from Target) to the bottom and bam, instant holiday bar cart. My bar cart is from Target and I 100% recommend purchasing. 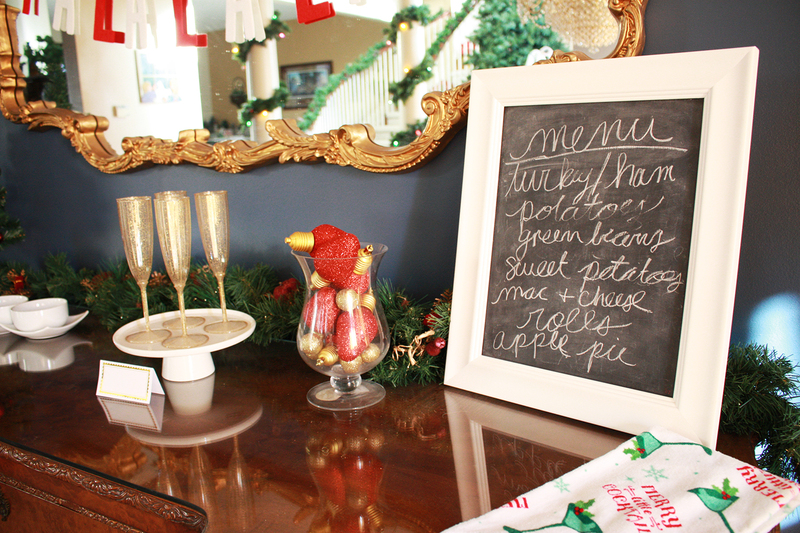 For the buffet I used the same chalkboard I used in my Thanksgiving tablescape and switched up the menu. 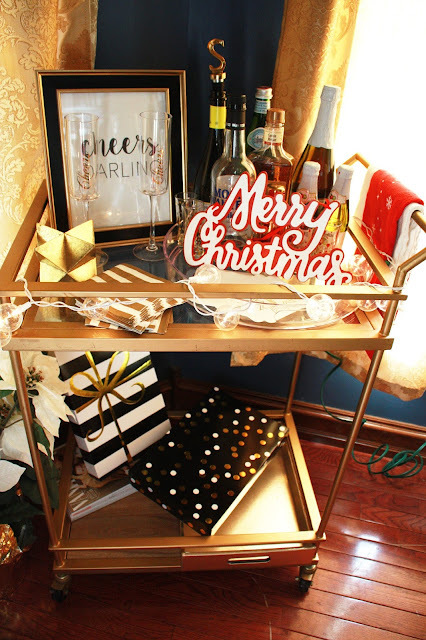 I also added a piece of greenery to the top, a vase filled with large red glittered faux Christmas lightbulbs from At Home, a cakestand with champagne glasses and a banner I found at Target. The Christmas tree is actually the one from my bedroom that I brought down, thus the shoes stuck in it. Haha! The big monogrammed S ornament and the monogrammed sweater is from Kirkland's, the red ornaments and star are from Target. I searched high and low for the perfect tablecloth and placemats and finally found them at Target. 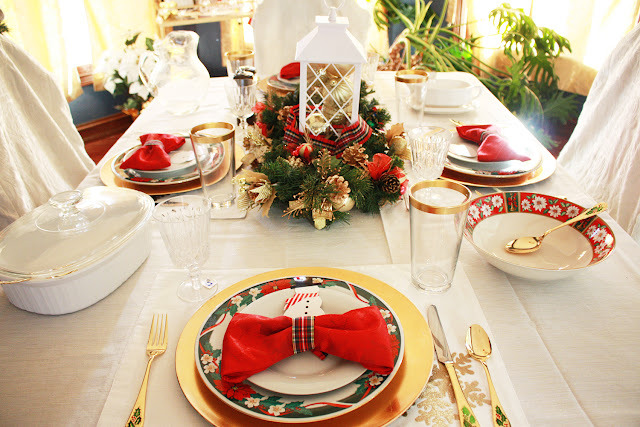 The tablecloth has gold in it, tying everything together. The gold chargers are also from Target but you can get them anywhere, like the Dollar Store. The goblets, serving dishes and napkins my parents had so I'm not sure where they're from. The gold rimmed glasses are from At Home. The snowman tags are from Target and are actually gift-tags but make the perfect namecards! The poinsettia plates and gold silverware are actually heirlooms that my grandma passed down to me. They hold a special place in my heart which I'll share all about in another post! The mini Christmas tree I got from At Home and the ornaments are from Target. The bowl set is from Aldi and the Fa La La La banner from Target. I should probably mention Target is in no way, shape or form sponsoring this post. I just happen to love Target and they have amazing holiday stuff! Haha! 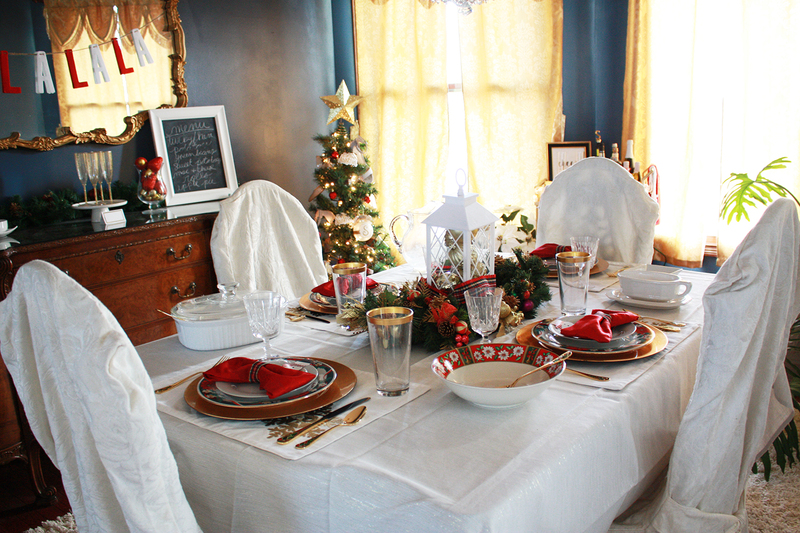 The centerpiece is one of my favorite parts of the dining room. The greenery is something my mom put together years ago so I'm not sure where everything is from. Probably Hobby Lobby or Michael's. 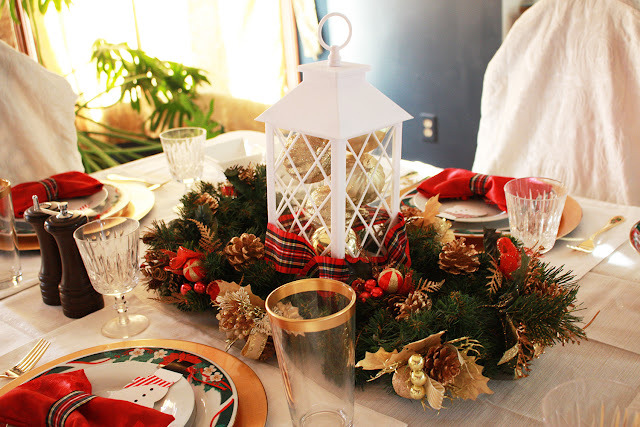 I found this white lantern from Kirkland's and filled it with gold ornaments from Target and stuck it in the middle. Added some plaid ribbon at the base and voila, instant centerpiece. Everything shown I can't find online so I apologize for that. My best advice is to go in store and find them. 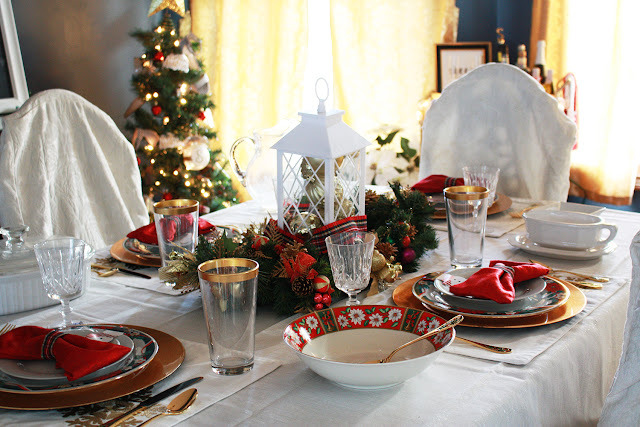 My favorite places to look for holiday/entertaining items are Home Goods, TJ Maxx, Target (obviously), Kirkland's, At Home, Burlington Coat Factory (they have an awesome entertaining section), Wal-Mart, Hobby Lobby and Michael's. I absolutely love the way the table and everything turned out! 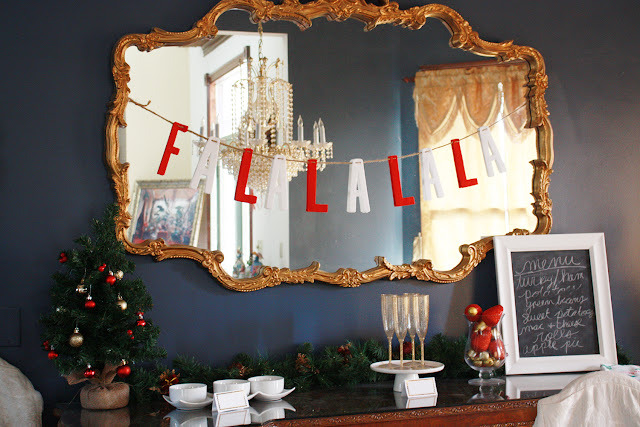 It's festive and jolly but still classy and put together, a winning combo in my book! 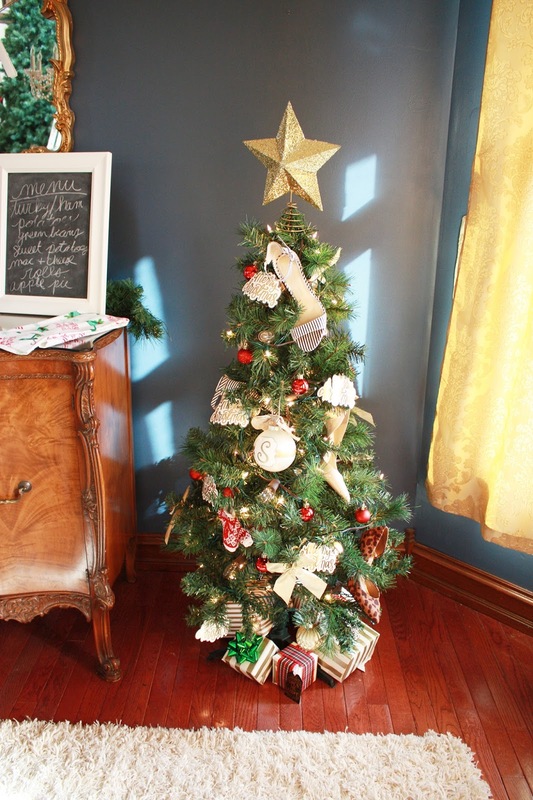 Some other fun holiday decor ideas are candy canes/sweets, nut crackers/other Christmas figurines, pinecones, ornaments, rustic elements like wood, burlap, etc. 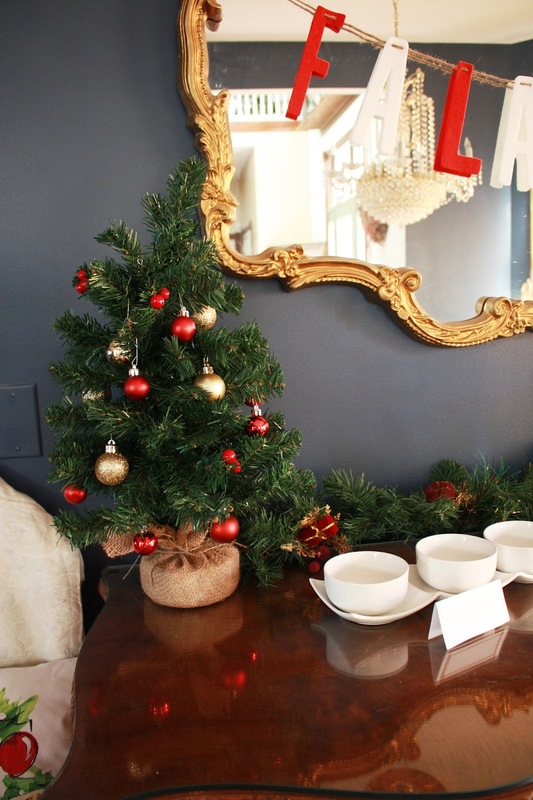 Check out this post for some Christmas decor ideas for your table or your home or my Christmas Pinterest board! 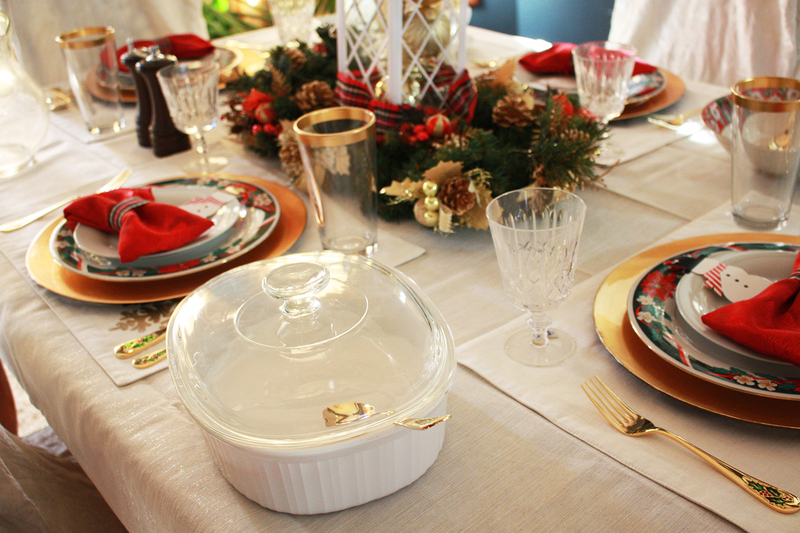 What's your favorite holiday dish? Is is something classic like green bean casserole or something unique? Share below!